The Navy put out newsletters to keep the WAVES up to date. The newsletters at first started out quite simple – just a copied sheet or two of paper with a few sketches – but ultimately the publications became quite polished, featuring in-depth articles, photographs and even comics. This newsletter was published in January of 1945. It was a national publication that was designed to go out to all WAVES regardless of where they served. 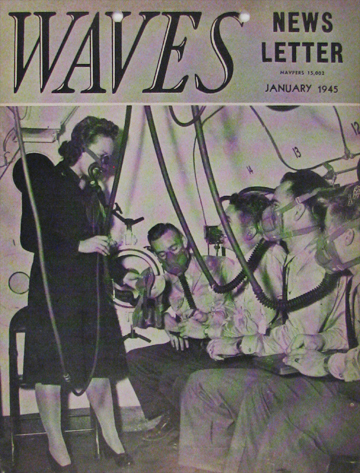 The photo on a cover shows a WAVE working with sailors who are learning how to use pressurized masks for high-altitude flying. The national newsletter focused on news of interest to any WAVE. But individual bases also put out newsletters, with location-specific information. This newsletter is held in the Betty H. Carter Women Veterans Historical Project at the University of North Carolina Greensboro. I wrote for The Conning Tower as a WAVE member of the 15th Regiment at Hunter. Do you know where copies may be? Wow – what a great assignment as a WAVE! I’ve seen copies at Smith College, University of North Carolina Greensboro’s Betty H. Carter Women Veteran’s Historical Project (http://library.uncg.edu/dp/wv/) and Radcliffe’s Schlesinger Library when doing research. Unfortunately, Lehman College (formerly Hunter College) really doesn’t have much in their archives. Kathleen (HH director).